The world today is facing the problem of scarcity of resources. Due to the scarcity of resources together with the trend of good governance, accountability, and new public management, there is increasing demand to restructure and refol1n public sectors. The govemments around the world try to find ways to improve their public sectors' perfol1nances through meaningful refornls (i.e. administrative reform, decentralization). Perfonnance measurement is perceived as one important strategy to improve govemrnent productivity because it can show how well the public sectors can perform and whether or not they still need to improve their capacities. Performance measurement is a broad concept covering many concepts and frameworks. 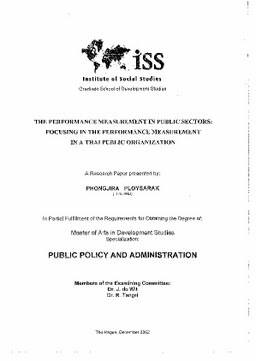 A lot of effort has been spent in order to find the best methodologies which can give the precise measurement of public sectors' perfonnance.